Camping! I get as excited about camping as Buddy the Elf does when he hears Santa is visiting the department store where he works (https://www.youtube.com/watch?v=B3FSFXJmdp8). I LOVE camping! There is nothing better than sitting around a campfire, enjoying a few days of nature with friends. We camp in a tent – no fancy RV’s or cabins for us! Our favorite campground is in the middle-of-nowhere Wisconsin. There’s no running water and we have to make do with pit toilets (glorified outhouses), but we love its rustic feel and secluded location. In the summer months, if we get hot and need to cool off (or rinse off!) we head to the local town lake for a leisurely dip. It’s always a great weekend filled with fun, friends, and FOOD! My idea of camping is pretty much doing as little as possible once camp is set up. Going for a hike or a trip into town isn’t on my agenda (unless we are going to the lake). Spending hours preparing a meal is certainly out of the question. My answer to this situation is preparing as much food ahead of time as I can. 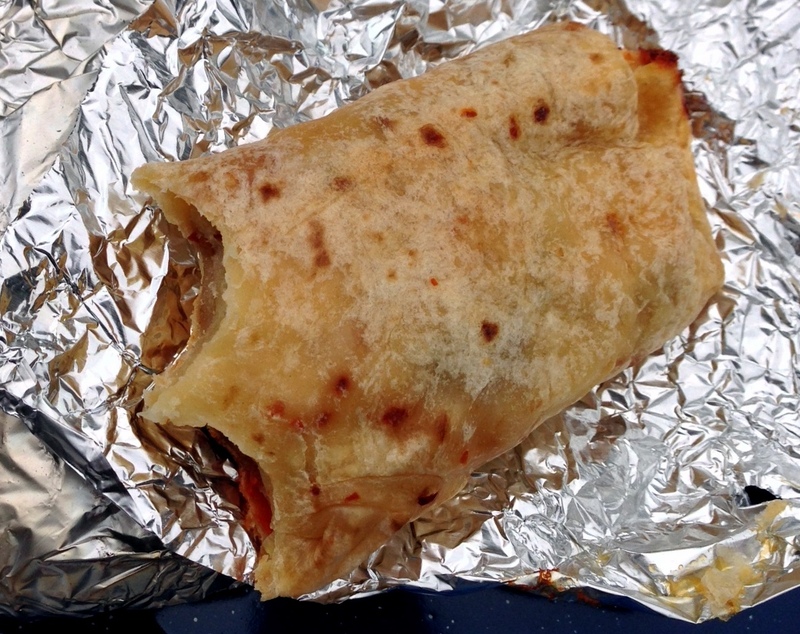 Our favorite easy breakfast while camping is campfire roasted breakfast burritos. You can use whatever your favorite ingredients are, but I wanted to share our favorites with you all. 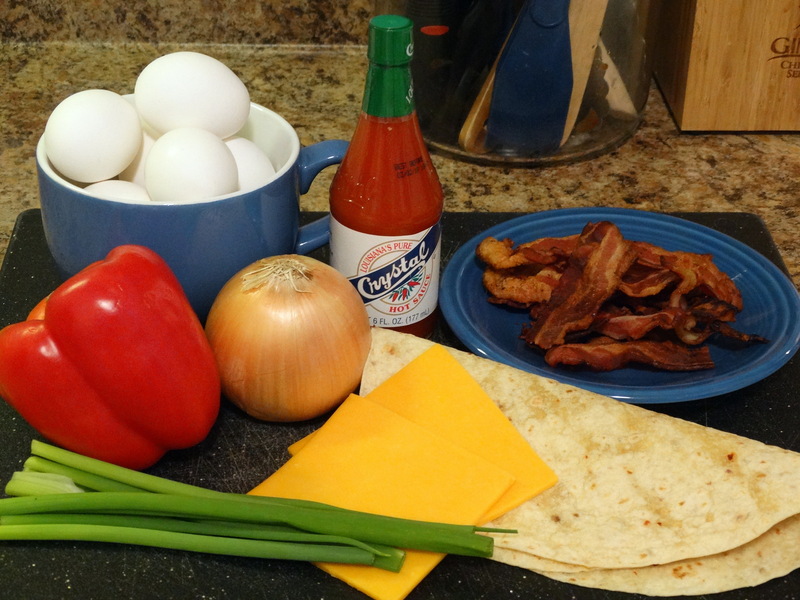 You will need eight 8 or 10 inch tortillas, some vegetable oil, 9 eggs, milk, crushed red pepper flakes, freshly ground pepper, half a red bell pepper, half an onion, 8 slices of bacon, a handful of scallions, some cheddar cheese, and your favorite hot sauce. Coarsely chop half a red bell pepper and half an onion. Sauté in a skillet with a tablespoon of oil until soft and the onion becomes translucent. While your veggies are sautéing, whisk 9 eggs, approximately 3/4 cup milk, 1 teaspoon crushed red pepper flakes, and 1 teaspoon freshly ground pepper in a large bowl. 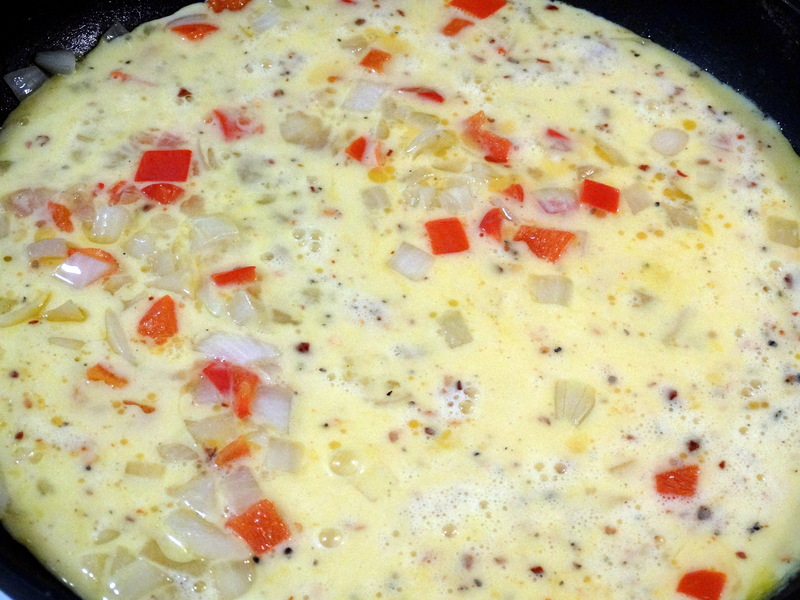 Add the egg mixture to your skillet, stirring frequently to scramble. When the eggs have firmed up most of the way, add 2 tablespoons chopped scallions and 8 crumbled, pre-cooked bacon slices. Fold them in and cook for another minute or two. Next, break up 2 slices of cheddar cheese into smaller pieces and scatter them on top of the eggs. 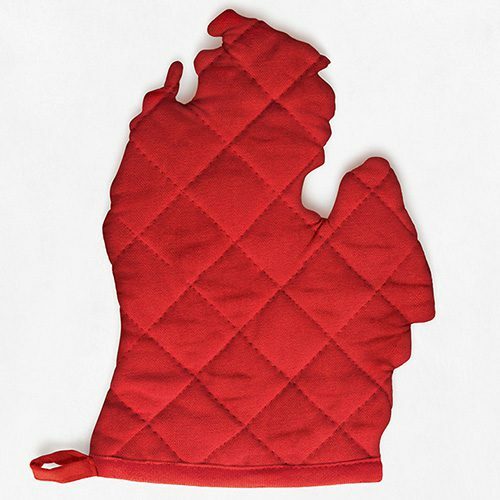 Cover your skillet and cook for another minute, then turn off the heat while leaving the lid on until the cheese has melted. To ensure that each burrito gets an equal amount of eggs, I use a spatula to spread the egg mixture into an even layer in the skillet and cut it like you would slice a pie. Then I scoop out a “slice” and put it on a tortilla. Wrap your burrito…like a burrito! LOL! Fold in 2 opposite ends and then fold in the 2 other opposite ends and roll. 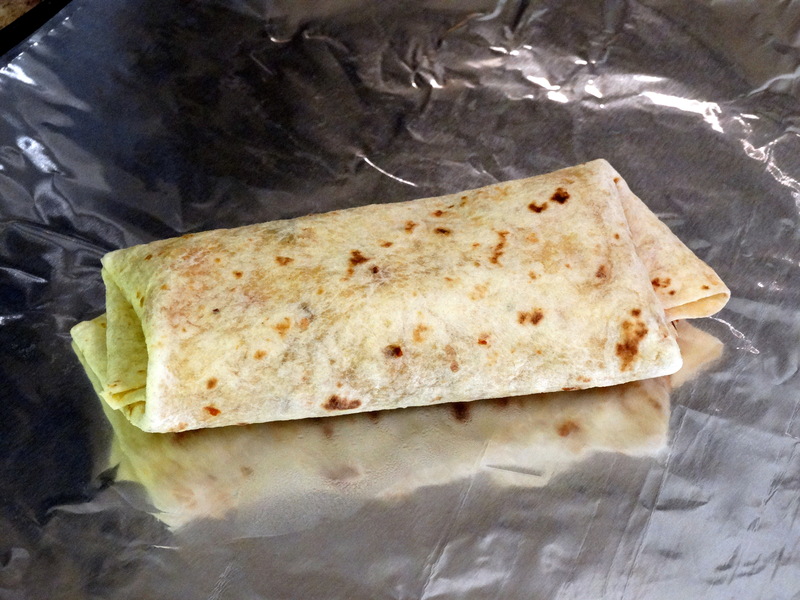 Wrap each burrito individually in a square of aluminum foil the same way you folded your burrito. Place your burritos in a large plastic zippered bag or a sealable container and keep on ice until ready to cook. In the morning, get a nice bed of hot coals going in the fire pit. Move the larger logs and flames off to the side. 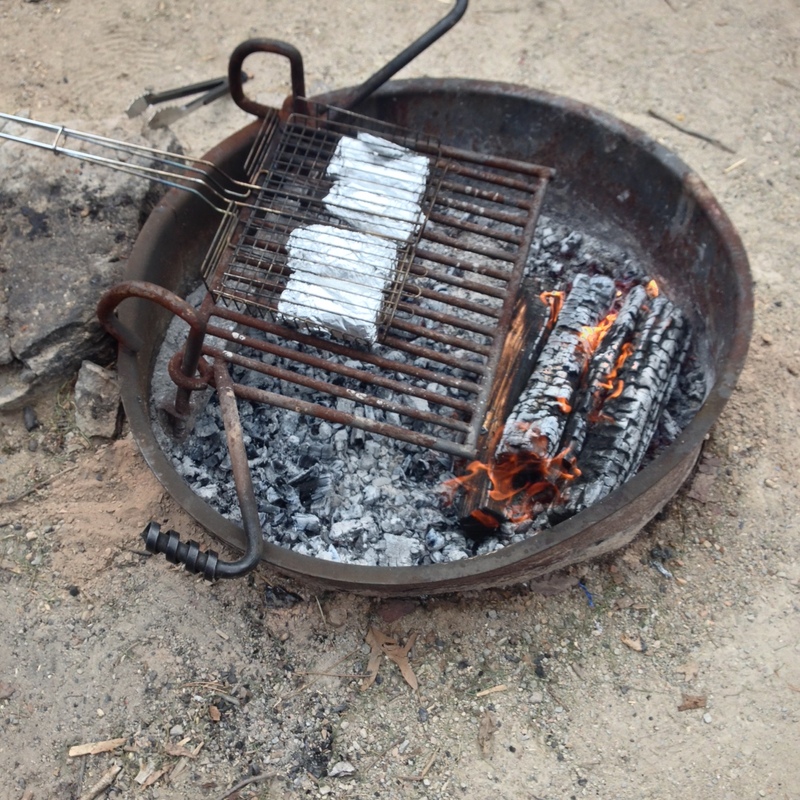 You can heat the burritos directly over the coals if you have a grate or basket. If not, you can warm them on the outer edge of the coals. Heat your burritos for about 10 minutes per side. You can open one to check and see if they are hot enough. It’s okay if the tortillas get a little singed – added flavor, yum! Splash a drop (or two…or three!) of your favorite hot sauce onto each bite and enjoy! *Be careful! Your burritos will be VERY hot when they come off the fire. It’s hard to resist, but let them cool just a bit so that you don’t burn your mouth. 1) Coarsely chop half a red bell pepper and half an onion. Sauté in a skillet with a tablespoon of oil until soft and the onion becomes translucent. While your veggies are sautéing, whisk 9 eggs, approximately 3/4 cup milk, 1 teaspoon crushed red pepper flakes, and 1 teaspoon freshly ground pepper in a large bowl. 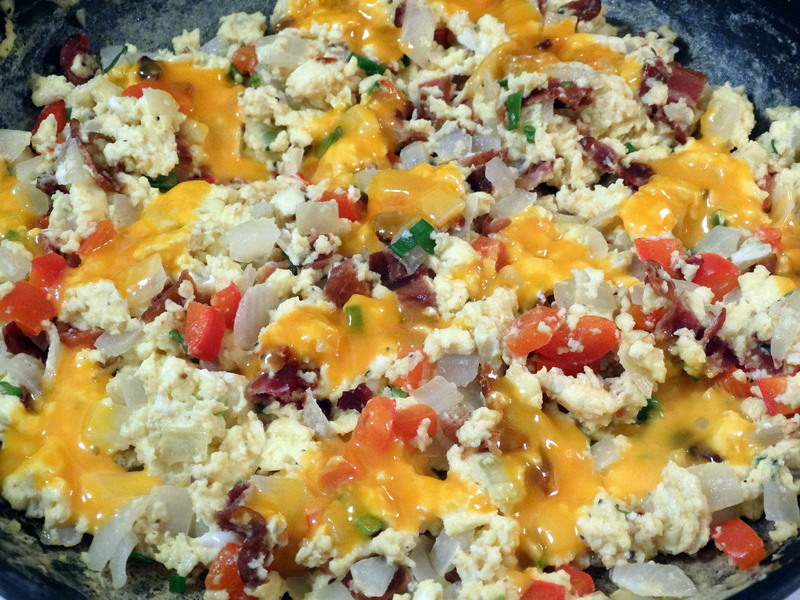 Add the egg mixture to your skillet, stirring frequently to scramble. 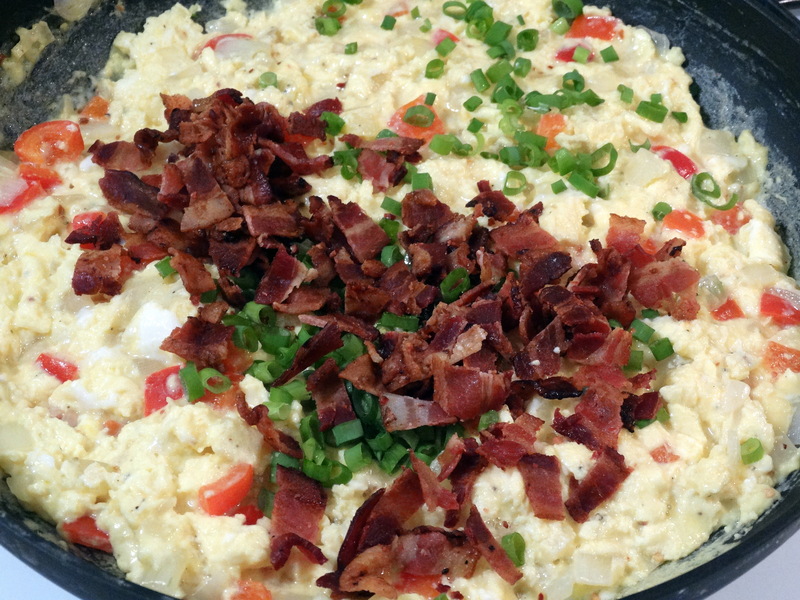 When the eggs have firmed up most of the way, add 2 tablespoons chopped scallions and 8 crumbled, pre-cooked bacon slices. Fold them in and cook for another minute or two. Break up 2 slices of cheddar cheese into smaller pieces and scatter them on top of the eggs. Cover your skillet and cook for another minute, then turn off the heat while leaving the lid on until the cheese has melted. 2) Scoop 1/8 of the egg mixture out and place it in the center of a tortilla. 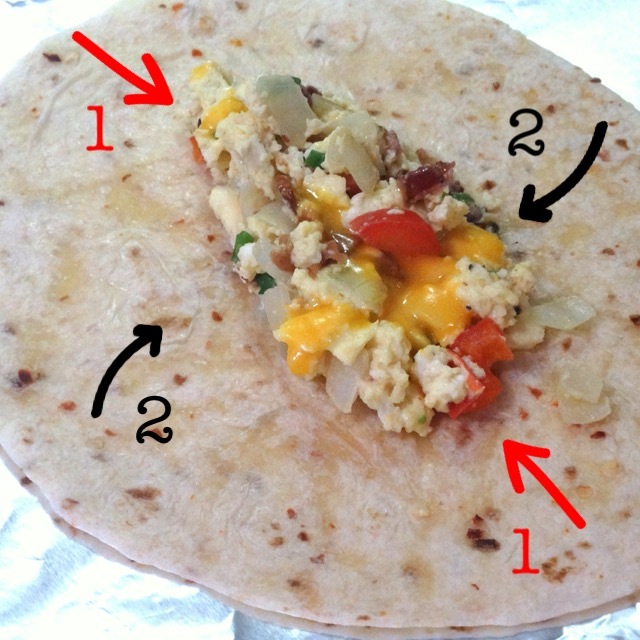 Fold in 2 opposite ends and then fold in the 2 other opposite ends and roll to form your burrito. 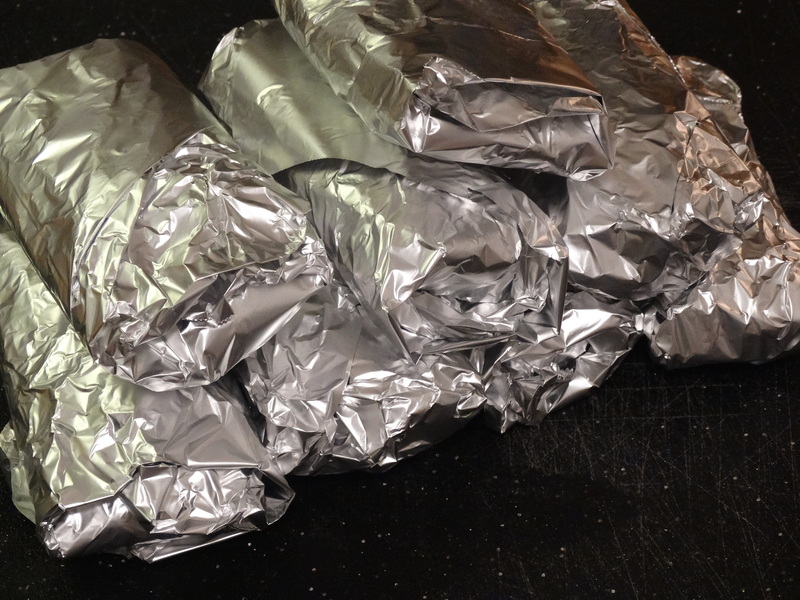 Wrap each burrito individually in a square of aluminum foil the same way you folded your burrito. Place your burritos in a large plastic zippered bag or a sealable container and keep on ice until ready to cook. 3) In the morning, get a nice bed of hot coals going in the firepit. Move the larger logs and flames off to the side. You can heat the burritos directly over the coals if you have a grate or basket. If not, you can warm them on the outer edge of the coals. Heat your burritos for about 10 minutes per side. Add your favorite hot sauce and enjoy!